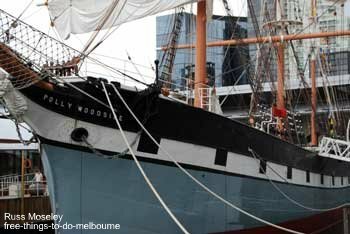 Polly Woodside is a three masted tall ship now sitting alongside the Yarra River. She's a reminder of the early days in Melbourne when everything was done by ships like these. Built in 1885 in Belfast, she was called Polly after the shipbuilder's wife. She made a lot of trips to Australia and ended up in Melbourne. She was even used in World War two as a refueling barge for naval ships in New Guinea. 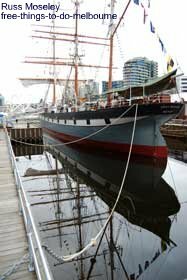 Bought by the National Trust of Australia in 1968, she was completely renovated and has been a 'museum' ship ever since. You can't go on board for free but you can get within almost touching distance. ......Instead, why don't you click on Polly Woodside, learn about her history and then go along and have a look. You'll find her by walking along the river from the Crown Casino, past the Melbourne Convention Exhibition Centre and you can't miss her! You can see from my photos how close you can get. Have a look at the map below too for directions. .......It's just across the river - take the footbridge, turn right and it's in the Trade Centre first floor. Ask at the police station on Flinders Street if you get lost!